Signing off and toasting: To getting blog posts so you can use them for consistent content marketing. As online health & wellness entrepreneurs, it’s easy to take on All. The. Things. When you see All. The. Things. it looks crazy! Your website is your home on the web. And if you really think about it: What’s the point of social media, advertising, and SEO anyway? TO BUILD RELATIONSHIPS, GET PEOPLE TO YOUR WEBSITE, AND ONTO YOUR EMAIL LIST! You need to interact, be social, be helpful, and share your stuff on those networks to get people to “know, like, and trust” you, go to your website, and opt into your email list. Your website is where you collect all of your content and intellectual property. And your blog is your main content marketing platform. By regularly publishing valuable content on your blog and promoting it (e.g. on social media), you get people to “know, like, and trust” you, go your website, and opt into your email list. But, not everyone has a stash of blog posts ready to publish every week! So, how do you get blog posts? I’ve listed them in order of cost. You can save a ton of time and money by asking guests to contribute (but please do it the right way!). Buying “done for you” blog posts will be inexpensive, but still need a bit of time to customize them. Hiring a writer is definitely the most expensive, but if you hire a reliable one who really jives with your brand, each post may only need a quick review (with a couple of comments), and then a copy/paste onto your blog for publication. Let’s go over the pros & cons of each of these (based on my experience doing all of these). This works exceptionally well if you love researching, writing (or recording), and editing. And you have committed to the time it takes. PRO TIP: You can even outsource the research and/or editing, and stick with just the creation/writing/recording. This does not have to be a huge time-consuming chore! You will need regular chunks of time to do this well. First of all, I highly recommend that you re-purpose content you already have (more on that below). 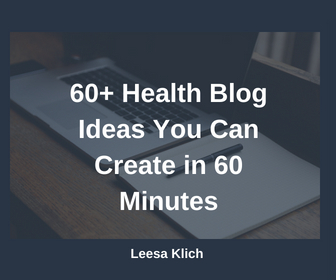 Second, if you want some inspiration on what to write about, here is a very comprehensive list of health and wellness blog topic ideas. PRO TIP: Use these ideas to help you plan out your blog editorial calendar in advance so you don’t have to worry about what to publish week after week. Third, once you’ve chosen your topic for your next post, you can research it efficiently before you write it up. Becoming more “findable” in search engines. These three build the all-too-important online “know, like, and trust” factors. Being consistent with content (i.e. weekly) helps more people get to know you and trust you. The more content you have on a topic, the more likely someone will find you through one of those pieces. By publishing consistently you are building trust (reliability) with those who follow you and want to hear from you. By talking about your niche topic in different ways over and over again you are showing that this is your area of expertise (and excellence). This builds your “like” factor because different people will resonate with different types of content. Plus, they’ll get to trust that you know WTF you’re talking about anyway. By consistently publishing blog posts on your niche, you become more “findable” by Google et al., so more people will get to know you. This is because you keep giving the search engines more proof what you’re all about. It is one (of 200) ways to start inching up the ranks to the first page. PRO TIP: Start linking your blog posts to each other like I did above. By doing this with descriptive “anchor text” (e.g. don’t link to “click here,” but instead describe what the link is about) you’re also giving those posts more “link juice” with search engines. If you want guests to contribute to your blog, especially if it’s unique content (i.e. not already on their blog, for example), you need to make it worthwhile for them. Don’t get me wrong – if you have a hobby blog, and want to volunteer to create content for other blogs by all means, go for it! I’m talking about online business owners who strategically use their blogs as content marketing machines to build their business in the limited time they have without burning out or giving up. Please don’t waste their (our) time. 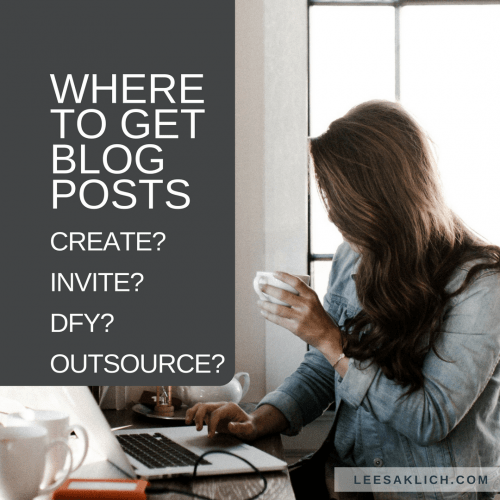 PRO TIP: If you’ve been asked to guest post, run through this little checklist to make sure it’ll be an investment in your biz, and not just picking up someone else’s slack. Make sure that you agree in advance if you want the content to be unique, or if it can be syndicated from another site (say, they’ve already published it on their blog). When it comes to the post itself, agree to a topic/title, and maybe some basic stuff like approximate word count, etc. But remember – these are their words not yours – you should not be editing their work substantially or without permission. If their name is on it, use their words! Make sure you agree in advance to a deadline that leaves time for publishing (and extra time in case things don’t work out – you’re not paying them, so it may not be a priority for them). Publish on your agreed date, and promote their post at least as much, if not more, than you promote your own posts. Tag them in your social media posts and thank them publicly. If you do things this way, and things work out, you will have a happy guest poster, who may very well agree to contribute to your blog again. “Done for you” (DFY) pre-written blog posts (or programs, webinars, cookbooks, etc.) are an inexpensive way to get high-quality content without paying for your own custom ghostwritten pieces (or creating things from scratch yourself). They’re “whitelabelled” products that you can use as your own and brand as your own. DFY health articles are a GREAT way to get content for those times you just can’t do it yourself. They save you frustration – You’re not paralyzed or starting from scratch or stalling on building your business. They won’t help you rank in search engines (because they’re duplicate content). Each vendor will have different terms, but I’ve never seen one that doesn’t allow you to customize and brand those products, and claim authorship (i.e. use them as though you created them). I honestly recommend that you consider any DFY products to be 80% done (not 100%). Of course, you can copy/paste, hit publish, and be done with it. But that won’t help you grow your biz! That’s content, not content marketing. Add your voice, style, and quirks. Edit it as though your business and audience depends on it (because it does)! Hiring a writer, be they a “ghost” or a by-lined author on your blog, is a huge investment. But, if things work out, then it’s a huge responsibility off your shoulders, and a huge leap in terms of developing your custom, unique, expertise over time. First, you need to find a writer who’s a good fit, for the right price. This can be tricky if you don’t know someone or can’t get a personal referral. How much do writers cost? It depends on what you want. Get the final version on time to publish on your site (along with the image, clicks to tweet, etc.). First, go over your editorial guidelines and see if the writer has any questions or concerns. Next, agree to the full scope of work. Who will be creating/updating the editorial calendar? What will be the schedule? Who will be promoting the posts once published? Will you be meeting with them monthly? Quarterly? For how long? PRO TIP: Any time a writer puts in time over and above the actual research/writing/editing is a price that is over and above their writing fee. Negotiate this at the beginning! Also agree on a smooth process whereby you can review and comment on the original document (e.g. Google docs works well for this). When do you have to get comments back to the writer? How many edits do you get? Usually one; sometimes two – that’s it. HOT TIP: “Ghosts” are not obliged to promote posts without their byline on it. It’s reasonable to ask a listed author to promote the posts to their followers, although, their followers may not be your target market anyway. Then, agree to a plan, a price, and a payment schedule so you can get booked into their calendar. PRO TIP: You will likely need to pay the writer in advance of the work being done or delivered. This is especially true when the total will be less than $1,000. When your writer asks questions, reply as soon as possible. When they are “on a roll” and “in flow” working on your stuff, and if you’re available, reply ASAP. After they submit work to you, provide comments in a timely manner. And, if for some reason you aren’t paying in advance, pay immediately upon receipt of the invoice! PRO TIP: If their name is on the piece, and they’re not a “ghost,” then the fee may be slightly discounted from a ghostwriting fee, but you also have less (a.k.a. NO) authority to edit their words. If you actually want your writer to turn your blog content into real content marketing, then keep them up-to-date with your products, services, current & future promotions, etc. Or, take it upon yourself to customize their (ghostwritten) posts to do this. PRO TIP: Don’t be surprised that writers, especially new ones, raise their rates at least once (or twice) per year. There are lots of options you have when it comes to ensuring consistent content for your blog. You can create everything yourself (albeit, much can be re-purposed). You can invite guests to post (the right way). You can use “done for you” pre-written content (but please customize it). Or you can hire a writer/ghostwriter. The main thing is to ensure you’re consistently publishing excellent content on your blog/vlog/podcast to build your “know, like, and trust” factor, and get people to visit your website and sign up for your email list! How much do you create yourself? Will you invite guests (the right way)? Do you purchase and customize DFY posts? Want to hire a writer? Excellent article (as usual) Leesa! So much of what you say here resonated with me because I have had a fair share of icky guest posting experiences where I felt “used” and misled. However, in hindsight I should have also done my homework and dug a little deeper to make sure that the website I submitted to was attracting traffic – the right kind of visitors – and that the owner was promoting content.